In a press conference Sunday, Rep. Bart Stupak explained his decision to reach a deal with President Obama that involves Obama issuing an executive order about abortion funding. 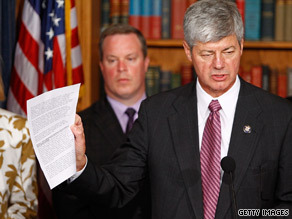 Washington (CNN) – An anti-abortion rights organization is withdrawing an award it planned to present Rep. Bart Stupak, after the Michigan Democrat announced Sunday he would support health care reform legislation. The Susan B. Anthony List had chosen Stupak to receive the “Defender of Life” award at the “Campaign for Life Gala” Wednesday here in the nation’s capital. Stupak and several Democrats said that they would vote for the health care bill after President Obama assured them that no federal funding would be allowed to pay for abortion. Obama released an executive order that emphasized abortions would not be paid for with federal dollars. “By accepting this deal from the most pro-abortion President in American history, Stupak has not only failed to stand strong for unborn children, but also for his constituents and pro-life voters across the country,” Marjorie Dannenfelser, president of the Susan B. Anthony List, said in a statement shortly before the House was set to vote on the controversial bill. Dannenfelser charged that the executive order was not enough. "The executive order on abortion funding does absolutely nothing to fix the problems presented by the health care reform bill that the House will vote on this evening,” she said. “The very idea should offend all pro-life Members of Congress. An executive order can be rescinded at any time at the President's whim, and the courts could and have a history of trumping executive orders. Most importantly, pro-abortion Representatives have admitted the executive order is meaningless." Updated: 11:28 p.m.: Rep. Stupak spoke with CNN Sunday night about the decision of the Susan B. Anthony List. "I didn't seek the award," Stupak told CNN, "I stood on my principle. I don't need an award." –CNN Producer Lesa Jansen contributed to this report. So what was Bush, Reagan, Bush Sr? Abortion was legal under these three REPUBLICAN presidents and NOT ONE did anything to end it. I am NOT pro-choice but I have an observation. I do not want my tax $ funding abortion. However, many people pay out of their pocket toward their health care at work but how many people have bothered to check to see what their policy covers?